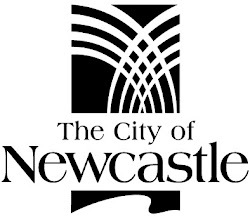 If you've visited the Civic precinct in Newcastle over the last couple of weeks, you may have noticed an unusual number of people wandering and staring at their phones. That's because Pokémon Go fever has hit Newcastle! Hundreds of people have been converging on Civic Park and the surrounding area to take part in this latest cultural phenomenon, that allows players to catch, collect, evolve, train and battle their favourite pocket monsters. Although playing Pokémon is generally considered the domain of kids, plenty of adults are having fun reliving their childhood and trying to collect all 151 Pokémon. A Doduo jumping out at a patron at Hamilton Library. 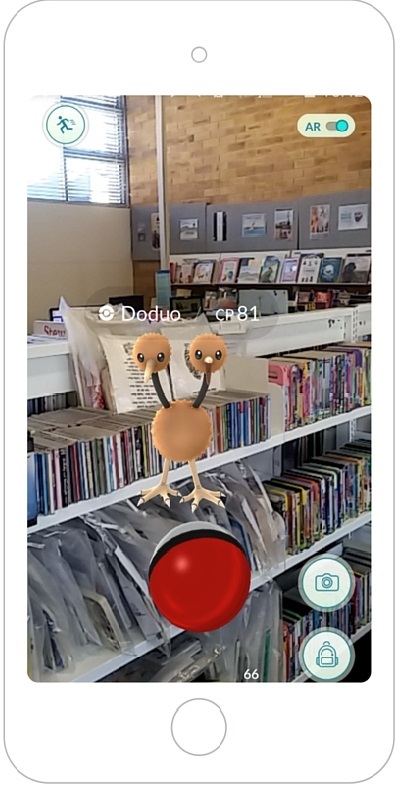 Many branches of Newcastle Region Library have become hotspots of Pokémon activity. 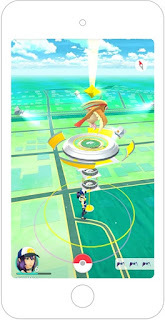 Hamilton, New Lambton, Wallsend and Adamstown branches are all pokéstops, where you can load up on useful items such as pokéballs for catching new Pokémon, and various potions for treating Pokémon wounded in battle. 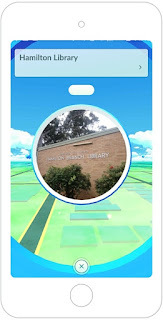 Lambton Library is even a pokégym, where players train up or battle their creatures against other teams. 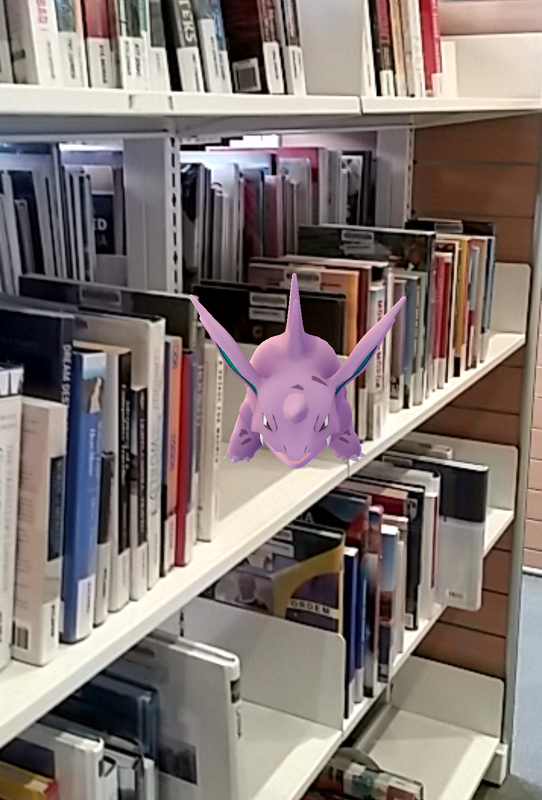 Plenty of Pokémon have also been located hiding in the shelves at City branch - a Nidorino has been eluding staff in the Adventure & Travel section over the last few days. Come in and see if you can catch it before we can! A Nidorino in the Adventure & Travel section at City Library. Still not caught! The app utilises augmented reality technology which takes a computer-generated image - in this case, a Pokémon - and superimposes it on the user's smartphone camera to make it look like the creature is right in front of them in the real world. It is not the first time this technology has been utilised. Previously, the Royal Botanic Gardens in Sydney and Melbourne implemented the Disney Fairies Trail app, which allowed visitors to use their smartphones to seek fairies whilst exploring different areas of the Gardens. Retail stores are also experimenting with the idea to set up virtual fitting rooms for their customers. Load up on pokeballs, potions and razz berries at Hamilton Library. The Pokémon franchise itself is nothing new. It was created in 1996 and was popularised in Australia through a trading card game. The creation of Japanese video game designer, Satoshi Tajiri, Pokémon was directly inspired by his childhood hobbies of collecting bugs and playing video games. Considered reclusive and eccentric by his peers, Tajiri was dubbed 'Mr Bug' for his seemingly obsessive behaviour. Tajiri has recently confirmed he has Asperger's Syndrome and is a great example of someone who has found a passion in their life and used it to build a successful career. Choose a team and battle it out at the pokegym at Lambton Library. If you're having fun playing the app and would like to check out more Pokémon related media, you can access a range of books, graphic novels and DVDs through Newcastle Region Library's catalogue, including the original Pokémon movie and a number of different guides to the world of Pokémon.